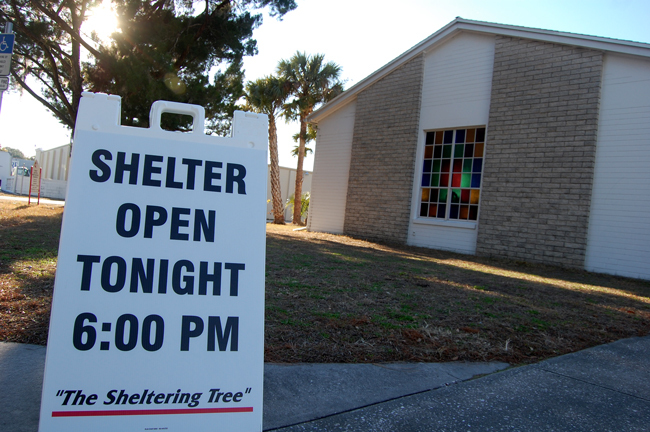 Volunteers at the cold-weather shelter in Bunnell got word last week that opponents to the shelter might go to the Bunnell City Commission Monday evening and complain. It wasn’t clear about what. And it never became clear: opponents of the shelter, or to some of the things associated with the shelter, did not materialize. Bunnell Mayor Catherine Robinson said that she had received some complaints. But she wouldn’t specify from who or how many, beyond saying that some businesses were complaining about panhandlers. One of the shelter’s advocates, who happens to be a Bunnell business owner, pressed Robinson to be more specific but got nowhere. Rev. Beth Gardner, the pastor at First United Methodist Church, clarified for the city council that the church ministry welcomes everyone to the church any day of the week: The homeless have access to the bathrooms 24 hours a day. They are welcome to help with the upkeep and maintenance at the church. No one is allowed to sleep at the property at night, unless it’s a cold night, when the temperature dips to 40 degrees or below. That’s when the shelter actually opens for the night. In early January, members of the board of the cold weather shelter, which goes by the name of Sheltering Tree, met with Arthur Jones, the Bunnell police chief, and members of the Bunnell city administration–including Judi Stetson, Bunnell’s grants administrator–to discuss preventive and longer-range issues as well as an annual census of the homeless. Jones estimated there are 45 homeless people in Bunnell proper. But discussion included mention of some 15 or so homeless people who aren’t part of the church’s social circle, but who associate with homeless people who are, and who tend to be causing more problems than the church group. In other words, there may be homeless cliques. But meeting participants agreed that homelessness, as an issue, would not be solved or managed except by a coalition of government, businesses and non-profit agencies. The Volusia/Flagler County Coalition for the Homeless documented 79 homeless people in Flagler County in 2010 (compared to 2,076 in Volusia County), 71 in 2008 (compared to 1,843), and 67 in 2008 (1,734). The 2011 numbers were to be compiled this week. Robinson said the matter would eventually make it on the commission’s agenda. Stay tuned, after Charlotte Marten’s recap of the week’s events, for a report on the Sheltering Tree and the homeless issue at the city commission earlier this week. The cold-weather shelter, incidentally, will be open tonight(Jan. 26), and likely for the following two nights, as temperatures are forecast to be at or below 40 again. I went and dropped off some donated items from the students in my classes and everyone there was so helpful. This is a WONDERFUL ministry and it is the ONLY ministry in this county for cold weather shelter for the homeless. I don’t see how ANYONE can be critical of it. People can die out there on these cold nights. These are human beings we’re talking about. Anyone who considers themselves pro-life should be in support of this shelter. And of course, if the homeless spend the cold nights here, they’re not ending up in our emergency room with frostbite, hypothermia, or worse, which should be good news for those worried about their tax dollars. Thank you to all involved at the Sheltering Tree!!! Yes, City Hall does have ghosts FlaglerLive and they have a spokeswomen in City Hall too. What a bush league attempt the Mayor did at this meeting to interject discontent with the Rev Beth and her work. Who are these ghost businesses that the Mayor speaks of? And why did she feel she need to be a spokeswoman for them? I firmly believe there is a hidden agenda here that involves the Chamber of Commerce, the County and the Mayor of Bunnell. I believe that they want The Sheltering Tree to be cut down in order for their masked agenda to move forward. Think about this. A new center will give someone a big budget to manage and a big salary to do so. Right now Voluisa County gives money to Flagler County. The powers that be would like to control those Federal funds here in Flagler County. The Mayor must have been channeling the Ghost Opposition or perhaps the Mayor feels that the Rev Beth Gardner has to much power in Bunnell. Either way, what she did was very under handed. I think Rudy is right about following the money to see the motivation for the Mayors hollow accusations. There is so much more going on here. Just wait and see how this plays out.